Ards recorded their first win of the season in some style last night, putting four goals past newly-promoted Newry City. Jonny Frazer scored a fine brace, with Mark Kelly and Kym Nelson also finding the net in a one-sided affair. Ards goalkeeper Sam Johnston did deny Newry goal, making a superb penalty save from Stephen Hughes. The Ards breakthrough arrived in the 26th minute, with Jonny Frazer crossing to Mark Kelly, who headed home his second goal in as many games. Ards doubled their advantage in the 37th minute. The high press allowed Ards to disrupt Newry's passing game, allowing Kelly to burst into the box and the striker played in Frazer, who kept his cool to slot the ball home. Frazer also had a hand in the third goal as it was he who was fouled just outside the area in the 42nd minute as Newry struggled to get to grips with his pace. From the resulting 20-yard free-kick, Nelson smashed home a set-piece that was more about power than finesse. Newry had a great chance to get back into the game in the 53rd minute when Kyle Cherry fouled Tiernan Rushe inside the penalty area. Stephen Hughes stepped up to the mark, but Sam Johnston got down to his right and produced a stunning save. 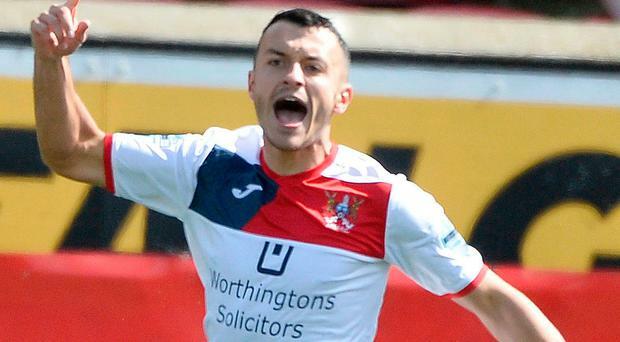 Colin Nixon's men grabbed the fourth in the 77th minute when a quick move saw David McAllister pick out Frazer at the back post, who fired the ball high into the Newry net. ARDS: Johnston; Byers, Elebert (Kerr, 45 mins), Taylor, McClean; E McAllister, Cherry, Nelson (J Kelly, 75 mins), D McAllister; Frazer, M Kelly (McLellan, 80 mins). Subs not used: Mooney, Mitchell, McKenna, McAleenan. NEWRY CITY: Maguire, King, McCaul (Lavery, 64 mins), Boyle, McCann, S Hughes, Teggart, Carville (Mullen, 88 mins), Rushe (Walker, 66 mins), M Hughes, McArdle. Subs not used: Delaney, Montgomery, Healy.